Some UNCG strengths that UNC System President Margaret Spellings noted in a mid-day question and answer session with reporters? Health care fields. Support of veterans and non-traditional students. Music. Nursing. The School of Education. Spellings, who took office as UNC system president March 1, is in the course of visiting each of the UNC system campuses. Last week, for example, she was in the eastern part of the state, with stops at Elizabeth City State, NC State and UNC Wilmington. Her April 25 visit to The University of North Carolina at Greensboro, which was titled “UNC Greensboro: A Legacy of Access and Success,” is the 14th in her ongoing meet-and-greet tour of UNC campuses. She also toured the SELF Design Studio, a makerspace in the UNCG School of Education Building. It features many emerging technologies and tools including 3-D printers, robotics, art supplies and circuitry kits. After a reception with students at UNCG’s Weatherspoon Art Museum, she enjoyed a tour of campus. A second roundtable, moderated by Provost Dana Dunn, was titled “Promoting Academic and Career Success.” This afternoon session focused on UNCG’s experiential learning programs and culture of teacher engagement, which provides a unique, enriched experience for Spartan students. Spellings spoke earlier about UNCG’s excellence in certain programs, though that fact may not be known widely enough. Programs such as UNCG Music are a “best kept secret,” she said. The special staged-concert event produced by the School of Music, Theatre and Dance (SMTD) will take place Friday, April 29, and Saturday, April 30, at 8 p.m. in UNCG Auditorium. “Into the Woods” tells the story of a childless baker and his wife and their quest to reverse a witch’s curse. Their journey includes iconic storybook characters such as Little Red Riding Hood, Rapunzel and Cinderella, among others. Directed by Triad Stage Artistic Associate Bryan Conger ’11 MFA and conducted by Music Supervisor of Broadway’s “Wicked” Dominick Amendum ’01, UNCG’s production is a unique twist on Stephen Sondheim’s classic musical. Instead of performing in an orchestra pit, the 22-piece orchestra – made up of UNCG students and alumni – will be on stage with the actors. For graduate student Taylor Hale, who plays the baker, the opportunity to work with Amendum is what makes this experience so valuable. Amendum has visited campus numerous times over the course of the semester to meet with students individually and in groups. Amendum has been instrumental in building strong musical theater offerings at UNCG. Starting in the fall, SMTD will offer a new minor in musical theater, with Amendum and Cowan continuing to cultivate the program. “Into the Woods” serves as the cast members’ final exam for their Workshop in Musical Theatre course. Ticket prices range from $10 to $20. For more information and to purchase tickets, visit performingarts.uncg.edu/into-the-woods. Band of Scholars: UNCG’s Folger Membership Thrives in D.C.
What’s next door to the Library of Congress, kitty-corner from the Supreme Court, and two blocks from the Capitol Dome? It’s the Folger Shakespeare Library, America’s great research Bard-O-Mecca, housing the world’s largest collection of Shakespeareana (including 82 “First Folios” of the Complete Works from 1623), plus half a million rare manuscripts, books, images, and artifacts ranging from the 13th to the 18th Centuries – not to mention its own Renaissance-style theater. 2016 is the 400th anniversary of Shakespeare’s death, and a banner year for UNCG: since joining the Folger Institute Consortium in 2011, the university has sent a dozen UNCG faculty and graduate students to spend plenty of time digging deep into the Folger’s great resources. As one of the newest members of the Consortium, UNCG has arrived on Capitol Hill with a splash, sending its best and brightest from across the disciplines to join in highly selective programs with professors and students from the likes of Harvard and Yale and Princeton, NYU and Chicago and St. Andrews. Hailing from such departments as History, English, Art and LLC, these UNCG “affiliates,” as eligible faculty and graduate students are called, have participated in programs ranging from weekend symposia to seven-day conferences to seminars meeting weekly for a semester or monthly for an entire year—and with most travel and lodging expenses covered by Folger Grants-in-Aid. “The Folger represents the Platonic Form of a research institution in the arts and humanities,” says Christopher Hodgkins, Professor of Renaissance Literature, Director of UNCG’s Atlantic World Research Network, and Faculty Representative for UNCG on the Folger Institute’s Consortium Executive Committee. For graduate students like Lauren Shook, Melle Elmes, and Neal Buck, Folger programs have provided an incomparable career launching pad. For Elmes, her Spring 2015 Folger seminar on ecology and catastrophe put into her hands some unforgettable documents and artifacts. “It is one thing to talk about the social effects of the plague; but it is quite another to examine county records of fatalities, written in a 16th century hand, and to see the names and numbers of the dead multiplying across the pages. In addition to its unexcelled collections and its superb programming, the Folger offers other things less quantifiable but just as real: ambience and fellowship. Shook elaborates: “Before the 3:30 session on Friday afternoons, many of us would meet for tea in the Folger’s Common Room; after our seminar, we continued discussions over a pint at the infamous Hawk & Dove on Pennsylvania Avenue.” And time bunking in the Folger Guest House next to the Library of Congress can keep the talk flowing late into the night. Applications for Folger Institute programs are open to UNCG faculty and graduate students across the arts and humanities, including not only history, literature and languages, but also music, theatre, dance, the visual arts, as well as religion, philosophy, and political theory. For more information and links for application, see www.uncg.edu/eng/awrn/folger_institute.html. UNCG’s Folger Institute membership is supported by Terri Shelton, Vice Chancellor for Research and Economic Development, and Tim Johnston, Dean of the College of Arts and Sciences. Stephen Sondheim’s “Into the Woods” sparked Bryan Conger’s fascination with theater. Now, he is directing a cast of UNCG Theatre students in this celebrated work. UNCG Theatre faculty member and Triad Stage Artistic Associate Bryan Conger directs a staged concert of the Sondheim musical April 29 and 30 in the UNCG Auditorium. Conger, an alumnus of UNCG’s MFA Directing program (2011), said that “Into the Woods,” which intertwines the stories of several classic fairy tale characters, inspired him as a young actor. As the production’s director, Conger wanted to break the traditional format of a musical, so he looked to the New York Philharmonic’s “Sweeney Todd” and “Encores!” at New York City Center for inspiration. Conger said that “Into the Woods” is a great play for families, combining sophisticated wit with vibrant music. Students from a UNCG musical-theatre workshop class will be performers. Find more information or purchase tickets at performingarts.uncg.edu/into-the-woods/. When film professor David Cook joined the UNCG Media Studies Department in 2007, “A History of Narrative Film” was in its fourth and largest edition. The textbook, which is used at the Beijing Film Academy, the Free University of Brussels and over 400 colleges and universities in North America is one of W.W. Norton & Company’s longest-running publications. It’s been translated into eight different languages and had grown into a thick volume of film history when Norton released the fifth edition in early March. The newer, fifth edition is slimmer and more comprehensive than the last. Cook cut pages of film descriptions – items that were becoming “list-like” – to add more analysis and a chapter on global cinema. And so far it’s the only edition of “A History of Narrative Film” to have UNCG stamped on the first page. Originally published in 1981 while Cook taught at Emory University, “A History of Narrative Film” was something of a risk for W.W. Norton & Company. Because of its many photographic illustrations and because its author was a relatively unknown scholar, Cook’s editors were uncertain of the book’s market. ‘It was a much welcomed but unexpected success,” said Cook. Cook, who has a Ph.D in Victorian English Literature from the University of Virginia, had originally focused his analysis on the director. Now in its fifth edition, “A History of Narrative Film” acknowledges the economics of filmmaking more than it has in previous editions. The textbook’s newest chapter, “A Global Cinema” explores the rise of independent film movements such as the Nigerian film industry known as Nollywood, a sort of thread-bare “people’s cinema.” Cook tracks the growing ability for “Hollywood mega-pictures” to skirt cultural divides, cashing in on a larger, global audience even as North American movie theater attendance is falling. As promised in the recent announcement of the Graduate School reorganization, I am writing to provide an update. I am pleased to announce that Kelly Burke, Associate Dean of Music, Theatre and Dance (MTD) and Professor of Clarinet, has accepted the position of Vice Provost for Graduate Education, effective August 1, 2016. Kelly has extensive experience with graduate education at UNCG. As a faculty member, she has taught in the Music graduate programs, chaired more than 15 doctoral committees, and been involved with graduate curriculum reform. As Associate Dean of MTD, Kelly has had responsibility for allocating graduate assistantships and for graduate enrollment growth planning. Kelly’s interest in leadership in graduate education goes back to her own time as a graduate student when she was the President of the Eastman School of Music Graduate Student Association. Kelly combines strong administrative talents gained from her years of experience as an Associate Dean and a Department Head with outstanding faculty accomplishments including being the recipient of the UNC Board of Governor’s Teaching Excellence Award in 2004 and a nominee in 2009 for the UNCG Research Excellence Award. Most recently she has led a group of faculty engaged in an important new initiative in partnership with the Educational Advisory Board, The Institutional Scorecard Initiative. When complete, this project will provide important enrollment capacity and student demand data to inform academic decision-making. Kelly also served as Chair of the Faculty Credentialing Committee for the last SACSCOC review. In addition to assuming oversight of the Graduate School, as Vice Provost Kelly will also work on other Academic Affairs projects and initiatives as time permits. Kelly will be assisted in her oversight of graduate education by two longstanding Graduate School administrators whose titles will change as follows: Laura Chesak, currently Associate Dean of the Graduate School will become Associate Vice Provost for Graduate Education and Scott Hudgins, currently Assistant Dean of the Graduate School will become Assistant Vice Provost for Graduate Education. While these changes will not become effective until August 1st, Kelly will work later this summer with Dean Wiener and other members of the Graduate School to begin to transition to the new role. Please join me in congratulating Kelly and welcoming her to her new role. Your participation is needed to help prioritize top issues facing staff at UNCG. Over the past year Staff Senate has worked closely with Campus Leadership on developing staff priorities. Through collaborative effort, we have assembled this survey to help define the top issues facing staff at UNCG. We have worked hard to capture your voice though forums, electronic forms, and in-person interactions. Now, we need you to help us prioritize these issues. Staff Senate will use your voice to continue to work with Campus Leadership toward practical solutions. We will be providing feedback and progress reports through the course of our normal operations moving forward. We feel it is important to note that no ideas were removed from this list, at any point. Similar items were grouped into actionable items, and several specific items (suggested at forums, etc.) have been answered and addressed. Answered items may not appear on the list to be ranked, but they can be viewed on our website— https://staffsenate.uncg.edu/. As we develop solutions in the future, this list and website will evolve. Please vote on ALL items (not just 10!) – we will identify top issues based on your vote. 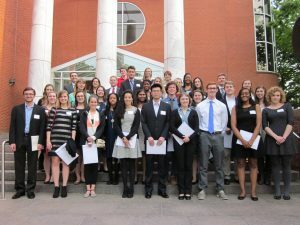 UNCG’s Epsilon Chapter of the Phi Beta Kappa Society held its eighty-second annual initiation April 13, 2016. After nearly 46 years on the UNCG music faculty, Paul Stewart will retire from UNCG with a celebratory recital. The free recital will be this Saturday, 7:30 p.m., in the UNCG Music Building Recital Hall. Music Professor John Locke will serve as master of ceremonies, the News and Record reports, adding that those who will perform with Stewart are Joseph Di Piazza, Andrew Willis, Diane Higgins, Rebecca Oden, Joshua Johnstone, George Kiorpes, Connie Kostis, James Douglass, Andre Lash and John Salmon. More information at News and Record, from which this information was drawn. The excellent “Pan American Modernism” exhibition leaves the Weatherspoon Art Museum April 30. Developed by the Lowe Art Museum at the University of Miami, the exhibition includes paintings, sculpture, works on paper, photography, and mixed media works. The works of art illustrate the many forms in which Modernism took shape and reveal the commonalities and disconnects that developed throughout the Americas. Rather than perpetuating a North American-centric hegemony, which tends to diminish and polarize works of art produced by Latin American artists, “Pan American Modernism” demonstrates that these artists were not working in isolation; rather, the global influences of Central and South American artists contributed to the experimental, innovative nature of Modernism in the U.S. The 2016 UNCG MFA Thesis Exhibition begins May 3. 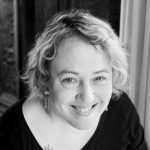 Friday, April 29, Foust Park, 11:30 a.m.
Friday, April 29, 6 p.m.
Erin Lawrimore (University Libraries), was elected to a three-year term on the Society of American Archivists’ (SAA) Council. The 12-member SAA Council is the organization’s governing body. It is responsible for ensuring SAA’s financial stability and growth, developing and implementing the society’s strategic priorities, providing overall leadership and direction for SAA and its component groups, building and coordinating relationships with individuals and groups outside of SAA and providing oversight of the society’s executive office. Lawrimore holds a B.A. in English from Duke University and an M.S. in Information Studies from the University of Texas at Austin. Prior to her 2011 arrival at UNCG as university archivist., she worked at N.C. State University and the University of Tennessee at Knoxville. She also serves as a lecturer for San Jose State University’s School of Information. Lawrimore has been an active member of SAA since 2001, previously serving as Vice Chair of the Committee on Public Awareness, Chair of the SAA Awards Committee, Chair of the Description Section, and steering committee member of both the Reference, Access, and Outreach Section and the Issues and Advocacy Roundtable. Founded in 1936, the Society of American Archivists is North America’s oldest and largest national professional association dedicated to the needs and interests of archives and archivists. Michael Logan joined UNCG as the new director of purchasing and contracts on April 25. Logan has over 20 years of experience in purchasing with significant management experience. He was previously the assistant director of procurement services at Wake Forest University, where he had been since 1999. He is an alumnus of UNCG, receiving his BS degree in Business Administration with honors. He is also a Certified Purchasing Manager (C.P.M) from the Institute of Supply Management (ISM) and is an active member with both the National Association of Educational Procurement (NAEP) and Educational and Institutional Cooperative (E&I). The UNCG School of Education Awards Ceremony was held earlier this month. See the video shown at the event, highlighting many excellent research initiatives and impact in our community and beyond. Dr. Keith Debbage (Geography / Marketing, Entrepreneurship, Hospitality and Tourism) presented the State of the City 2016 report to the Greensboro Partnership. As reported in the News and Record, the report is a comprehensive look at Greensboro by the numbers. “It examines key indicators of the city’s condition — including jobs, demographics, education, health and wellness — and it shows the city is moving in a positive direction, although some significant long-term challenges remain.” See more information here. Each year, thousands of young people in the Triad and beyond enjoy camps at UNCG providing summer learning opportunities. The camps are accepting applications for summer 2016. Visit www.smcamp.org to download the camp brochure and application. Explore your Creativity and Artistic Potential. The UNCG Department of Art is preparing for our annual summer arts and design camp for current 8th graders through 12th graders. The student artists will receive daily, studio instruction & supervision from UNCG faculty and art education staff. The department is offering a one week day or overnight camp followed by a closing student exhibition for the students’ artwork created at the camp. One-Week Day Camp: July 10 – 16, Overnight camp: July 10 – July 16. For more information visit www.uncg.edu/art/ArtCamp/about.html. The All-Arts, Sciences & Technology Camp is designed to give in-depth, hands-on instruction in the arts, sciences and technology. The camp also includes recreation, citizenship and evening entertainment. Campers are divided into two grade levels (2nd–5th, and 6th and up) for coursework – many different types of topics are offered. It is operated by SERVE Inc. in cooperation with UNCG’s Division of Continual Learning. There are overnight and all-day options. It’s week at UNCG is July 24-29. Visit allarts.uncg.edu to see details – or to register. Campers will create 21st century texts using digital tools such as storyboarding, blogging, and movie-making during this two-week camp experience. In daily writing workshops, students will work with UNCG faculty, graduate students, NC teachers, and local authors. The camp introduces young writers to the writing process, unlocks strategies of professional writers, and supports the development of a variety of writing styles. Write stories in the morning and build robots in the afternoon for an all-day integrated STEAM experience! Build an interactive robot based on your Young Writers Camp project. Learn how to build and program an artistically crafted robot controlled by motors, servos, LEDs, and sensors! The camp is two weeks, Monday – Friday, from 9 a.m.-noon, July 11-July 22. Enrollment is limited to 100 students. Students will be divided into three different sections based on grade level (3-5; 6-8; and 9-12). Each section will have approximately 30 students and at least two instructors. Enrollment is on a first-come, first-serve basis. Visit www.youngwriterscampuncg.com for registration and addtional information. The NCSPK is a highly structured, fun and supportive summer day camp program for 7 to 13-year-old children with Attention-Deficit/Hyperactivity Disorder (ADHD). The camp will run Monday-Friday, 8 a.m.-5 p.m., June 13th – July 29, with a break in activities during the July 4th holiday week. Enrollment is limited to 24 children, and this year a donor has provided partial scholarships to defray the cost for all eligible campers. The NCSPK is a unique summer day treatment program that brings together the expertise of the ADHD Clinic at UNCG and its partner, Noble Academy. The goals of NCSPK are to improve self-control, friendships, academic skills, organizational skills, sports skills, and self-esteem. In addition to daily behavioral and educational programming, children have opportunities for sports, arts and crafts, swimming, Bricks 4 Kidz, and weekly field trips. Parents also have weekly opportunities to learn specialized skills that improve parent-child relations and home behavior.For information visit www.ncsummerprogramforkids.org. The “IT is for Girls” a program for middle and high-school girls began in 2009. It is a week-long summer program and engages girls in middle, high-school and college through several hands-on technology and leadership activities. The program has been funded by NCWIT, AAUW and Lincoln Financial Group among others. Registration is now open for “IT is for Girls/We Make IT” Summer Camp, July 25-29, 2016. Details for this camp at the UNCG Bryan Building are at wiit.uncg.edu. The UNCG School of Music, Theatre and Dance offers Summer Dance Technique & Repertory Intensive June 13-17, 2016; 9 a.m. – 4 p.m. This intensive is open to rising high school juniors and seniors as well as college-aged and professional dancers. Students may register for the Technique portion (morning session) as a standalone credit; Dance Repertory credit requires enrollment in both sessions (full day). Students may NOT enroll in only Dance Repertory. REQUIREMENT: Intermediate to advanced level of dance training in contemporary and/or ballet technique. Applicants will be required to furnish contact information for two (2) dance instructors to speak to student level. The Intensive offers students the opportunity to explore new and current techniques in the field of Contemporary Dance training and repertory, with UNCG BFA alumna Christal Brown. Details and registration information are at http://performingarts.uncg.edu/summer-dance-intensive/. Interested in North Carolina ecology – particularly local populations of reptiles and amphibians? The HERP Project, an NSF-funded program, will offer residential and daytime only week-long herpetological research experiences for rising 9th –12th graders again this summer. In 2016, The HERP Project is co-sponsoring programs at Chestnut Ridge Camp & Retreat Center, Greensboro Natural Science Center and Elon Academy (applicants must be enrolled in Elon Academy to apply). All programs are currently accepting applicants and scholarships are available. See information at theherpproject.uncg.edu. Dr. Catherine E. Matthews (UNCG Teacher Education & Higher Education) is the project director. “The Listening Lab” auditory training and language intervention for children diagnosed with auditory processing disorder (APD) will be offered from June 20, 2016, to July 1, 2016, 9 a.m.-noon. For more information, return the application in the brochure. Horsepower Experience at the Therapeutic Learning Center in Colfax, NC. This year the summer camp will serve school-aged children with fluency disorders. The camp will be held June 20, 2016-July 1, 2016, 9 a.m.-noon. 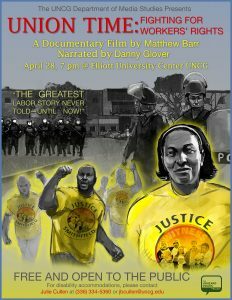 For more information contact Perry Flynn at pfflynn@uncg.edu or 336.256.2005. For more information visit http://csd.wp.uncg.ed/shc/about/. Though summer sports camps are not operated by the university, UNCG coaches own and operate camps in a variety of sports – and many are on the campus. The coaches’ contact information may be found here. UNCG Employee Field Day will be April 22, 11:30 a.m. to 1:30 p.m. It will be held in Foust Park. The SPCA of the Triad will have animals on hand, and are accepting donations of items for pets. Items needed include Dry/Wet Food, Toys, Blankets, Treats and monetary donations. This “Fill the Truck” donation drive is hosted by UNCG Staff Senate. Additionally, the Greensboro Police Department will have a K-9 unit demonstration throughout the event. There will be light snacks and water – but bring a brown-bag lunch. Employees will enjoy games, prizes and music. There will be lawn bowling and corn hole, as well as a picnic area. An obstacle course and other games will be set up as well. Come have fun and enjoy the camaraderie of your co-workers during the mid-day hour. Rain date is one week later, same time, same location. Pre-register for a chance to win prizes – individual and team events. Visit Healthy.UNCG.edu for full details – or contact healthy_uncg@uncg.edu or 334-4131 for more information. Rockets launched, snakes slithered and goo formed on the campus of UNCG this past Saturday. More importantly, however, children and teens from across the Triad explored the wonders of science and its role in their everyday lives. Nearly 3,000 people participated in more than 70 interactive and hands-on exhibits led by UNCG students, staff and scientists from across the state. Science Everywhere is an official NC Science Festival event, hosted by UNCG’s RISE Network. This was the second year UNCG participated in the festival, and attendance tripled this year. The UNCG School of Nursing’s Veteran Access Program puts veterans with medical training on an accelerated path to a bachelor’s degree in nursing. Each veteran’s path is customized to his or her training and experience. “The Veterans Access Program took my military training and turned it into credits for nursing school,” one student explained. The faculty, several of whom are veterans themselves, help their students with the transition from soldier to student. See how several students, as well as UNCG alumna Susan Safran, describe the program, which literally gives credit for those who served. And download the full magazine at alumnimagazine.uncg.edu. 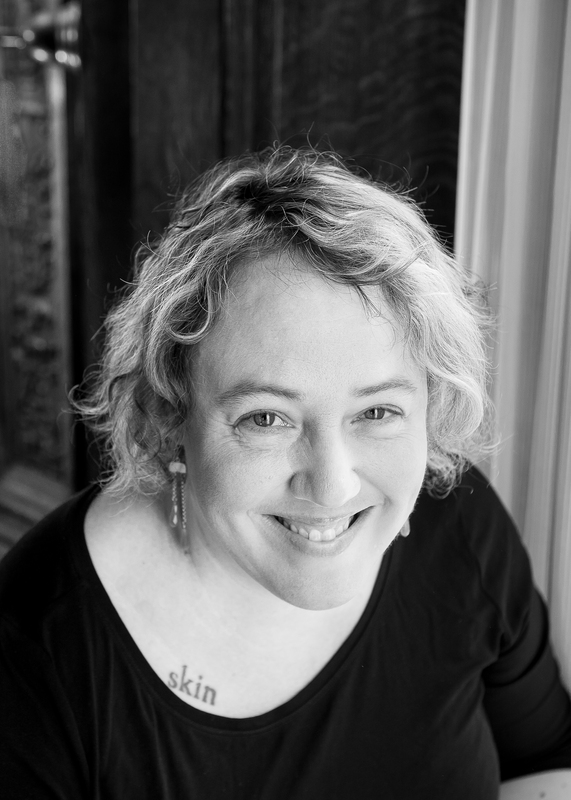 Alumna Kelly Link, a graduate of UNCG’s MFA in Creative Writing program, was named a 2016 Pulitzer Prize finalist in the category of Fiction. The news was announced Tuesday. Link will return to campus later this month, as she receives the UNCG College of Arts and Sciences’ 2016 Distinguished Alumni Award. Link is the author of three collections of short stories, “Stranger Things Happen,” “Magic for Beginners,” and “Pretty Monsters.” Her short stories have won three Nebulas, a Hugo and a World Fantasy Award. Dr. Thomas Matyók (Peace and Conflict Studies) recently spoke on the Vital Role of Religion in Civil-Military Interaction at the United States Southern Command Senior Leader Symposium. The symposium, History and Mystery – Religion Matters III, was a “strategic level academic forum” bringing together scholars, senior military and government leaders, and staff to engage religious subjects of current interest as they impact development strategies and partner capacity. Dr. Jeremy Rinker (Peace and Conflict Studies) gave a talk commemorating the 125 birth anniversary of Indian social reformer Dr. B.R. Ambedkar. This is an event that is sponsored by The Ambedkar Association of North America (ANNA) and the Religious Studies Department of Michigan State University. He delivered the paper “Chosen Traumas and Chosen Glories: Reading Dr. Ambedkar as Narrative for Social Change” last weekend in East Lansing. The paper explores the power of storytelling for social change in the life and work of Dr. B.R. Ambedkar and his modern day followers. Specifically, the paper/talk will look at the role that stories of injustice and triumph play in his life and work, as well as, the life and work of his living followers. Rinker is an assistant professor at UNCG’s Department of Peace and Conflict Studies where he researches the intersections between narrative, violent conflict, and nonviolent conflict transformation. His work on the Ambedkar-Buddhist social movement in Maharashtra, India is a provocative approach to the connections between justice, narrative and identity. While much of his research has focused on the centrality of justice discourse in religiously based social change movements, he also has interest in restorative justice, political violence, and conflict intervention practices, as well as, trauma, memory, and reconciliation. Rinker is currently engaged in a research project that looks at how marginalized communities utilize discursive practices to contest against an unresponsive state malfeasance and hegemonic bureaucracy to ensure basic rights and state services for the marginalized. Wednesday, April 20, 5 p.m.
On Monday, April 25, UNCG, along with Alcohol and Drug Services of Guilford will host a Town Hall Meeting in the EUC Auditorium from 6:30 pm to 8:30 pm focused on preventing underage drinking in the Guilford County area. The Town Hall meeting will feature higher education staff, Guilford County Schools representatives, local and state representatives, parents, students, law enforcement, etc. to offer strategies and resources to assist parents, educators, students and all those concerned with keeping our community healthy and free from the negative consequences of underage and other high risk drinking. Four lucky students will win a brand new Fitbit. 6:30 p.m. Reception – Photo Voice Display and Information Fair. The International Travel Fund (ITF), created by the Provost’s Office, supports ca. 50 UNCG faculty members per year to present their work at international conferences outside North America. Applications are accepted on a rolling basis and processed typically within two weeks of receipt. Faculty may apply once per year every two out of three years. To apply for ITF funding, please visit http://www.uncg.edu/ipg/faculty.html. There will be a UNCG Global Engagement Faculty Learning Group meeting Tuesday, April 26, from 3-4 p.m. in the Faculty Center. Seung-Hyun Lee (Media Studies) will share about implementing the Global Engagement QEP goals into her courses. For more information you may contact the UTLC Global Engagement Fellow, Dr. Melody Zoch (Assistant Professor, Teacher Education and Higher Education), at mzoch@uncg.edu. Anyone who would like to provide feedback on the candidates for Human Resources associate vice chancellor are encouraged to visit the search website and provide comments by this Friday (April 22). Two candidates were on campus last week; candidate number 3, scheduled to visit campus next week, has withdrawn from the search. Submit your comments on the two candidates at research.uncg.edu/avchrsearch. Ever since theater professional Debra LeWinter met UNCG professor and social worker Alicia Kaplan, the two have been dreaming about creating a theatrical production that sheds light on issues within the foster care system. Six years later, that dream has become a reality. “Foster Care Chronicles: Wrongs of Passage” has opened at the Triad Stage’s UpStage Cabaret in what is the Department of Social Work’s first Triad Stage production. Written and directed by LeWinter, “Wrongs of Passage” tells the real stories of local youth ages 15-23 who have gone through the foster care system. Seven of the nine cast members will have their personal stories depicted in the show. In order to conceal the originator of each story, the cast will take communal ownership of the stories and perform each other’s experiences. The remaining two cast members are undergraduate students in UNCG’s Theatre Department. The show is set in a preschool and highlights both the positives and negatives of the foster care experience, including the trauma that many children in the system face. The play was born out of a similar 2009 production directed by Kaplan. Preparation began back in the fall, when Kaplan and LeWinter led the cast through a series of group bonding and processing activities. The show starts at 8 p.m. on April 21, 22 and 23, and at 2 p.m. on April 24. Ticket prices are $18 for adults and $12 for students. The show is free for individuals in foster care and their chaperones.The content of the play is mature and is not recommended for children under the age of 13. Tickets are available for purchase at the Triad Stage Box Office or online at triadstage.org/series/207/foster-care-chronicles-wrongs-of-passage. The production is funded by the Health Resources and Services Administration (HRSA) Behavioral Health Training Grant and serves as a way to train social work students in using the arts for self-expression and healing. Photography by Martin W. Kane. UNCG Professor Alicia Kaplan (center left) and “Wrongs of Passage” Playwright Debra LeWinter (center right) rehearse a scene with cast members Alysa Rambo (far left) and Malik Worthy (far right). Starting in the fall of 2016, UNCG’s Department of Languages, Literatures, and Cultures (LLC) will offer a new concentration for students who are interested in developing multiple literacies and strengthening intercultural skills. The concentration in global languages and communities, one of four concentrations offered in the department’s newly restructured Bachelor of Arts, takes the traditional language program to the next level by providing students the opportunity to study two or more languages at the same time. The department offers programs in Chinese, French, German, Japanese, Russian, Spanish and American Sign Language. Additionally, the curriculum is designed to help students develop and strengthen intercultural competence, a valued skill for any career path. “The vision behind this program is to encourage students to think of themselves as participants in a globalized world and to understand that the world is everywhere, including here on UNCG’s campus,” said Associate Professor of German Studies and Associate Department Head Dr. Susanne Rinner. According to Rinner, research shows that global readiness – enhanced by fluency in at least two languages – offers students more career opportunities and significantly increases their earning potential over a lifetime. The new curriculum includes three core courses – Global Crossings, Global Green and Global Cultures Through Film – as well as others that examine a variety of subject areas from a global perspective. The program also requires an intercultural experience, which can be met through study abroad, and a service-learning course. “It encourages meaningful interaction with languages through community engagement,” Rinner said. In addition to global languages and communities, the restructured BA in languages, literatures, and cultures will offer the following concentrations: French and Francophone studies, German studies and applied languages (K-12 teaching licensure in French and Spanish). The department also offers a BA in Spanish and a graduate program that allows students to complete a Master of Arts in languages, literatures, and cultures with concentrations in French and Spanish. To learn more about LLC, visit uncg.edu/llc. The Smithfield struggle in Tar Heel, NC, is an important chapter in the history of unions in the meatpacking industry. It also demonstrates the convergence of labor rights and civil rights. 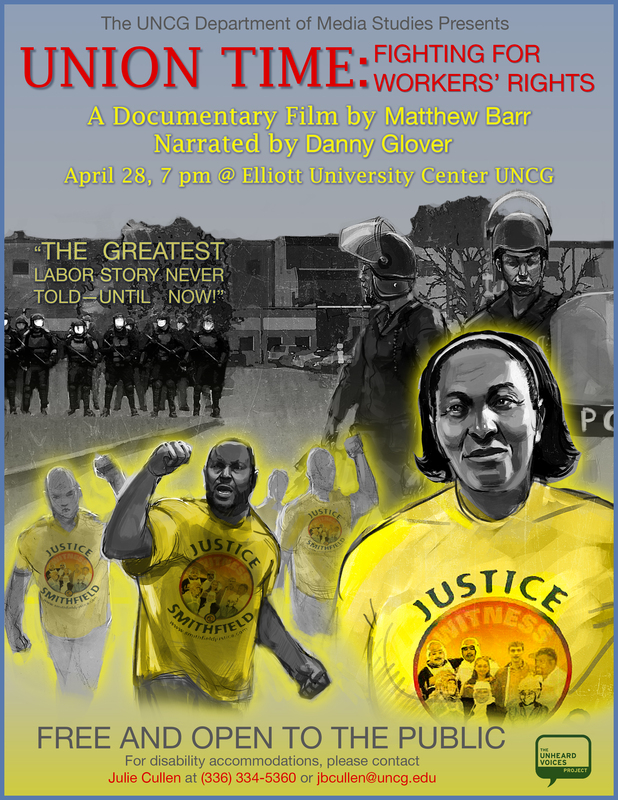 The film “Union Time: Fighting for Workers’ Rights” premieres at 7 p.m., April 28, 2016, at the Elliott University Center. It is free and open to the public. Matthew Barr produced and directed the documentary, filming from 2007 to 2015. Barr is professor of Media Studies. His film work focuses on the impact of globalization and social change on working people. “Union Time: Fighting for Workers’ Rights” tells the story of the meatpacking workers who fought dangerous working conditions at the Smithfield Foods pork processing plant. From 1993 to 2008, workers sought to organize a union. In the third union election in 2008, a majority of plant employees voted to bring in the United Food and Commercial Workers’ Union (UFCW). Since that time, UFCW Local 1208 in Tar Heel has successfully negotiated higher pay rates and safer working conditions.